The Siamese is arguably the oldest recognized breed of domestic cats. 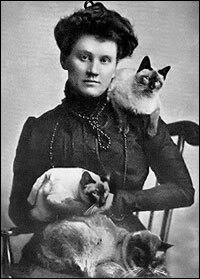 There is no question that it was this breed, first imported into England in the last quarter of the 19th century, which provided the impetus there for the cat fancy known around the world today. 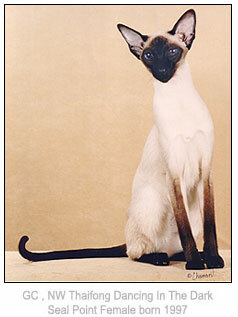 Siamese appeared in catalogues of the Crystal Palace Show in London as early as 1881. In recent years it has been fashionable to regard the legends surrounding "The Royal Cats of Siam" as more fancy than fact. Yet, it is interesting that the earliest publications in England consistently refer to the breed as both "The Royal Cat of Siam" and "Siamese." This has to do with the claim of protection and breeding under royal supervision in Siam by those who chronicled the earliest imports into Europe. Yet these early authors were adamant in their claims of royal protection, and they persisted with their assertions to a degree that suggests truth. Certainly the Siamese we know and love was revered in its native land long before we knew of its existence. The translation into English in 1998 of the historic Thai Cat Poems or Tamra Maew (published in The Legend of Siamese Cats by Martin R. Clutterbuck) clearly describes a white cat with black ears, face, paws and tail known as Maew Kaew, or Wichien-maas. These poems are between 100 and 200 years old, but reflect a literary culture much older, and contain many illustrations from very old manuscripts. The Siamese “voice” itself is a testament to its lengthy residence among us. An indication of successful, lengthy domestication of any animal can be found in a high level of communication with and affection for human beings. This is especially true of felines, a naturally independent species. No breed surpasses the Siamese in its ability to communicate and in its love for human beings. Persistent in its efforts to communicate, the Siamese and its offspring breeds are well known for this singular trait. Always aware of the world around them and cognizant of the gorgeous cat being bred and promoted in England, American fanciers spared no expense in importing many beautiful examples of the breed quite early. 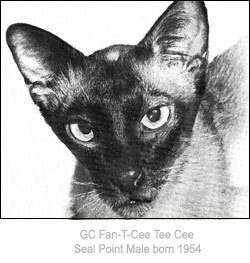 Siamese are found in the Beresford Cat Club Stud Books in 1900, and the first Siamese to be awarded Best Cat in Show was in 1907. With characteristic charm, the breed vanquished this continent as thoroughly and decisively as it had captured the hearts of Merry Old England. Classes became large; color classes expanded to four: sealpoint, bluepoint, chocolatepoint, and lilacpoint. CFA recognized the bluepoint in 1934, the chocolatepoint in 1952, and the lilacpoint in 1955, five years before the English did so. The four Siamese colors have been together on the CFA show bench for 50 years; the breed itself since CFA began in 1906! But it was in the years directly preceding and following the Second World War that the popularity of the Siamese soared, along with the burgeoning of the American cat fancy. Siamese and Persians dominated the show scene, with classes of well over a hundred Siamese being commonplace. Having fallen hopelessly in love with the Siamese color pattern, the consequence of a temperature-controlling enzyme that restricts color to the coolest parts of the body, the American public clamored for this glamorous pet. The exotic structure of the Siamese cat was overlooked by the general public in favor of its paint job. This misplaced focus has resulted in a widely-held notion, persisting yet today, in the so-called “Traditional Siamese.” The only traditional Siamese is the Siamese bred in the tradition of excellent structure as well as color. It has been with a sigh of relief that those who treasure the breed have welcomed today’s more secure place of the Siamese as a revered, popular breed among other favorite breeds of cats. Accordingly, Siamese to be found in cat shows at present are much more representative of the breed and consistent in type, because they are exhibited by breeders dedicated to preserve the finest attributes of this ancient cat. The Siamese cat has been the inspiration, if not the primary genetic source, for many other breeds (Balinese, Colorpoint Shorthair, Javanese and Oriental), has figured in the creation of the Himalayan Persian and Tonkinese, and has served in the development and/or maintenance of the Burmese, Havana Brown, and Ocicat. The Siamese is not only a mainstay of the pedigreed cat world for its own distinct, intrinsic beauty, it is an unsurpassed genetic wellspring to which many breeds owe their existence and, in some cases, continued well-being. The Siamese is, in short, a feline treasure. The year 2006 marked the centennial celebration of both the Cat Fanciers’ Association and one of its original recognized breeds, the Siamese. Boren, C: History of the Siamese. The Cat Fanciers’ Association Yearbook. Eatontown, NJ, 1959. pp 23-32. Boren,C: History of the Siamese. The Cat Fanciers’ Association Yearbook. Eatontown, NJ, 1960. pp 59-70. Boren,C: History of the Siamese. The Cat Fanciers’ Association Yearbook. Eatontown, NJ, 1961. pp 71-78. Boren,C: History of the Siamese. The Cat Fanciers’ Association Yearbook. Eatontown, NJ, 1962. pp 105-122. Clutterbuck, MR: The Legend of Siamese Cats. White Lotus Co., Ltd., Bangkok, 1998. Denlinger, M: The Complete Siamese Cat. Denlinger’s, Richmond, VA, 1952. Jennings J: Domestic or Fancy Cats. London, 1893. Naples , M: This Is The Siamese Cat. T.F.H. Publications, Inc. Ltd., 1964. Simmons EB: Cats. Whittlesey House, McGraw-Hill Book Co., Inc., London, 1935. Simpson F: Cats and All About Them. London, 1902. Weir H: Our Cats and All About Them. London, 1889. White, B: The Siamese. Cat Fancy. Feb. 1996. pp 32-33. White, B: We Are Siamese…Yesterday, Today & Tomorrow, Part 1. The Cat Fanciers’ Association Yearbook. Ocean, NJ, 1987. pp 658-665. White, B: We Are Siamese…Yesterday, Today & Tomorrow, Part 2. The Cat Fanciers’ Association Yearbook. Ocean, NJ, 1988. pp 178-185.